A holiday in Barcelona is for everyone and anyone seeking fun in the sun, good food, good shopping and interesting sightseeing. The artistic legacy of Barcelona is one of the city's most appealing offerings, with museums containing extensive collections of the works of Miro and Picasso. Regarded as Spain’s most cosmopolitan city and boasting a beautiful coastal location, Barcelona, the capital of Catalonia is one of Europe’s most visited cities. With legacies from the famous architect Gaudi to be found across the city as well as historic buildings from across the centuries, Barcelona is one of the leading cities with regard to architecture and art. Popular for its sandy beaches and nearby mountains, there is more to Barcelona than just the city itself. Barcelona is very easy to reach from the UK with a good selection of airlines operating flights to this popular city. For direct, cheap flights to Barcelona check out fares on Iberia, British Airways and Monarch. 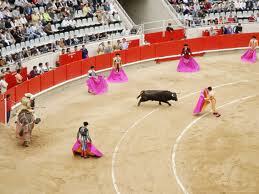 Low cost flights to Barcelona, Spain are operated by easyJet and Ryanair from selected airports. Barcelona is full of incredible buildings and landmarks with its gothic heritage and Gaudi-designed creations. Gaudi’s unfinished Sagrada Familia is possibly Barcelona’s most famous attraction, an incredibly ornate church with 18 towers. If you’ve got a head for heights, take the lift up to one of the towers for stunning views across the city. Other famous Gaudi masterpieces in the city include Guell Park, a miniature landscape garden and city of houses with colourful mosaics and fairytale buildings, Casa Batllo, a remodelled 19th century grand house and Casa Mila, an impressive apartment building with typical Gaudi-esque curves and character, Barcelona is famous for its magnificent gothic buildings including La Seu Cathedral which dates back to the 13th century and took an incredible seven centuries to complete. Other attractions worth visiting are the National Palace home to the National Art Museum and the Museum of Contemporary Art. Head to La Rambla, one of Barcelona’s most famous streets, for its shops, market stalls and street performers or catch some sun on one of Barcelona’s nearby beaches. To escape the heat and bustle of the city, the nearby Montserrat Mountain is ideal for a day trip, take the cable car for an exciting and steep ascent. Look no further than our superb flight search facility at Directflights.com for the best offers on direct cheap flights to Barcelona. We recommend that in order to find these flights you book well in advance avoiding peak holiday times such as during the school holidays and of course Christmas. Whether you’re looking for lastminute flights or simply booking in plenty of time prior to departure, check out our fares for the most competitive flight prices around. 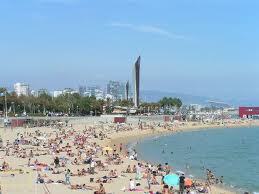 Barcelona enjoys a wonderful climate with hot summers and cool winters. The ideal months to visit the city, the Costa Brava, and the nearby resorts of Sitiges and Vilanova are May, June and September, when visitors can expect good weather. In August, despite the shade in the tree-lined boulevards, locals desert Barcelona for the coastal resorts to escape the heat. January is the coldest month, with top temperatures averaging 55F (13C), while August is the hottest, with an average high of 82F (29C).